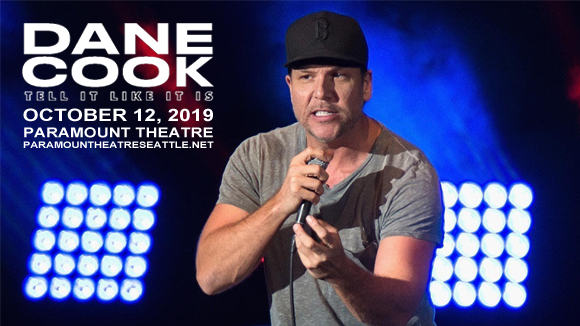 Prolific comedian Dane Cook returns to the stage for his first full-length tour in six years, bringing Tell It Like It Is to Paramount Theatre Seattle on Saturday 12th October 2019! Cook's high-energy, absurdly physical and intelligently worded dude-next-door comedy has won him millions of fans over the years! Expect great things from this hilarious comedian and his brand new material! American stand-up comedian and film actor Dane Cook began his career in an improv/sketch comedy troupe in the early 1990s. He moved tow New York City in 1994 and performed around the comedy clubs for two years before moving to Los Angeles. In 1998, his big break came when he was invited to appear on Comedy Central's Premium Blend, followed by a half-hour special on Comedy Central Presents two years later, which won him the Comedy Central Stand-up showdown twice in a row. His first CD/DVD, Harmful If Swallowed, was released in 2003 and was certified platinum. His 2005 follow-up, Retaliation, went double platinum and made Cook the first comic in 29 years to have an album at number four on the Billboard charts. In addition to his career in stand-up, Cook has appeared in a variety of films since the late '90s, including Mystery Men, Waiting…, Employee of the Month, Good Luck Chuck, Dan in Real Life, Mr. Brooks, and My Best Friend's Girl.